Home » Terrorism » What motivates foreign ISIS fighters? New research has an answer. 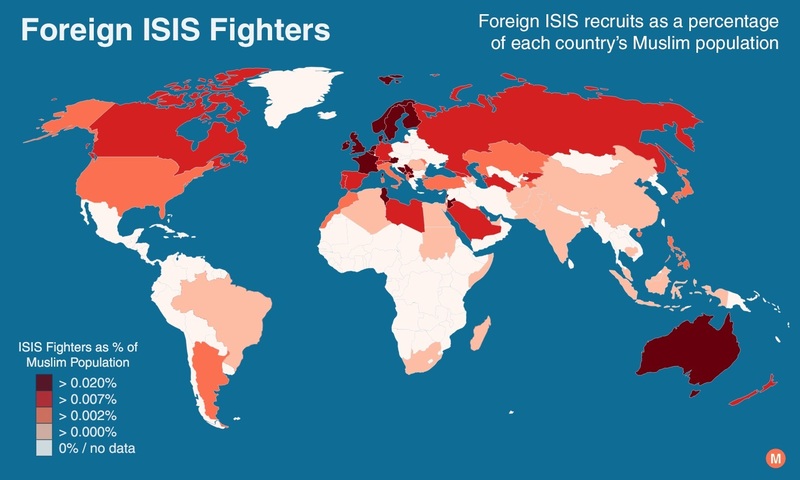 The data for this map comes from a paper published yesterday by the National Bureau of Economic Research: What Explains the Flow of Foreign Fighters to ISIS?. The paper is authored by Professor Efraim Benmelech of the Kellogg School of Management and Esteban Klor, Economics Chair at the Hebrew University of Jerusalem. As the map shows, the Muslim populations most likely to join ISIS are not in the Middle East or Africa. Rates of ISIS recruitment are highest in highly developed western countries, the ones with cultures you might least associate with radical Islam. The finding is consistent with several other studies that have found overwhelmingly negative views of ISIS in majority-Muslim countries. The table below lists countries with the highest and lowest rates of recruitment (excludes countries having 2 or fewer ISIS fighters). At the top of the list is Finland. Of its Muslim population of 42,000, 70 are estimated to have traveled to Syria or Iraq to join as ISIS fighters. That puts Finland on a par with Pakistan, a majority-Muslim country with the 7th largest population in the world. Despite having a Muslim population over 4,000 times larger than Finland’s, Pakistan is estimated to have an equal number ISIS fighters. 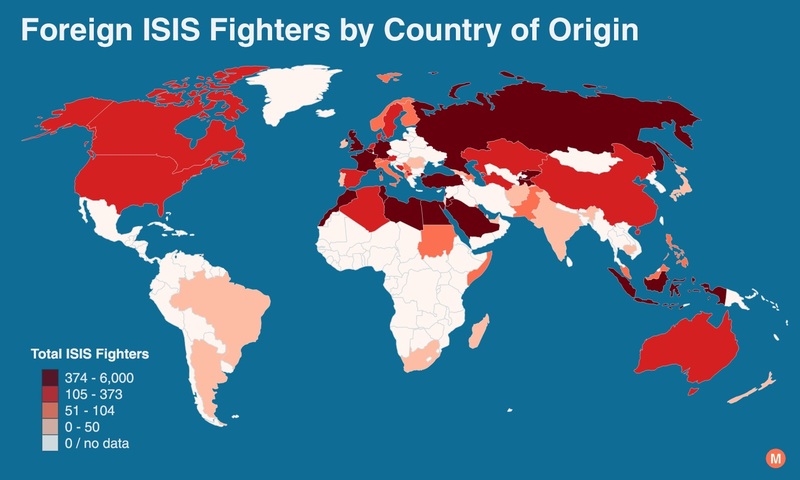 What do ISIS fighters’ countries of origin say about their reasons for joining? Is there a relationship between a country’s economic conditions and its rate of ISIS recruitment? Source: What Explains the Flow of Foreign Fighters to ISIS? In contrast to what many have theorized, poor economic factors are not the root cause of ISIS recruitment. In fact, the data suggests the opposite is true. Countries with high economic development and low income inequality tend to produce more ISIS fighters. As the paper concludes, ISIS fighters tend to come from countries that are ethnically and linguistically homogeneous, where assimilation is more difficult for immigrants. Because the analysis looks only at correlations, it does not reach any conclusive determinations about the causes. However, the authors theorize it is cultural isolation that induces some Muslims to become radicalized. If you’d like to go through the data yourself, here is a spreadsheet with the data for all countries. It includes both “official counts” and “unofficial counts,” given in tables 1 and 2 in the paper. The data for Muslim populations is from 2010 and comes from Pew Research. And if are curious to see which countries contribute the most ISIS fighters in absolute terms, here is that data in another map. I guess I am confused why the rate of recruitment as a percentage of the Muslim population is the relevant metric at least with respect to the question, “[w]here ISIS fighters come from.” Sure, 70 ISIS fighters come from Finland, but recent attacks show that fighters are recruited through tightly knit, often family based, networks. It is very possible all 70 knew or were related to one or several persons who were themselves related. That factor would seem way more important for recruitment than whether they were poor or disaffected or whatever. But, all that still doesn’t answer where ISIS fighters come from. They don’t come from Finland. ISIS fighters, 7,000 of them, come from Tunisia. Fighters are a question of absolute numbers, rather than as a percentage of the population from which they are recruited. For example, if you wanted to curtail ISIS recruitment, it would seem more productive to start with Tunisia and not Finland. If I understand your comment Evan, you’re saying there are other factors more important than cultural isolation. If the goal is to stop ISIS recruitment, it would be better to focus on those factors and in the places where the greatest number of ISIS fighters come from. If so, I agree. In any decision, bigger factors matter more than smaller factors. But best is to understand them all (true for investment decisions too, no?). 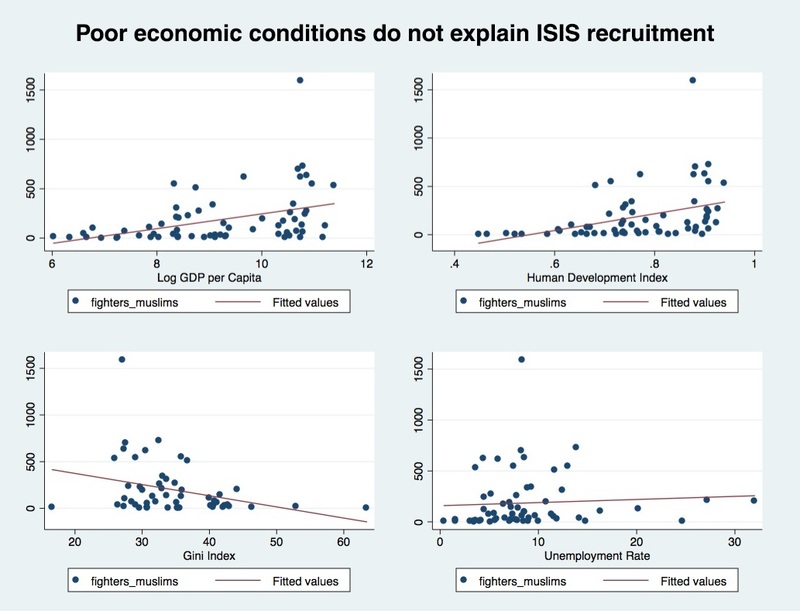 The real question asked here is “how do socioeconomic factors impact ISIS recruitment?” Many people have speculated on the question, and this paper gives a pretty clear answer. Separate point, but I think we have different views on what the big picture goal is: war against ISIS vs war of ideas. Are Muslims the only source population for foreign-origin ISIS fighters? Or is that source so large as to make the percentage of non-Muslims joining/converting-then-joining negligible?